TAMPA, Fla. - An estimated 5.4 million people in the U.S. have been diagnosed with Alzheimer's disease and that number is expected to increase exponentially as baby boomer generation enters their golden years. But for some people, coconut oil has proven to slow the progression of Alzheimer's and may have even prevented it. One of those people is Steve Newport, whose Alzheimer's has slowed considerably. Some of his symptoms even reversed, thanks to the unlikely treatment prescribed by his wife, Dr. Mary Newport, a physician who runs a neonatology ward at a Tampa, Fla., hospital. Dr. Newport became determined to help her husband after the severity of his disease was discovered through an Alzheimer's test in which the person being tested is asked to draw a picture of a clock. Sign up for a free Fact Sheet: Fight Alzheimer's Disease With Coconut Oil "He drew circles and several numbers just in a very random pattern, didn't really look anything like a clock," she said. "And the doctor pulled me over to the side and said, 'You know, he's actually on the verge of severe Alzheimer's at this point, he's beyond moderate," Dr. Newport recalled. "So that was very, very devastating news," she said. Dr. Newport began learning everything she could about her husband's disease. "It appears to be a type of diabetes of the brain and it's a process that starts happening at least 10 or 20 years before you start having symptoms and it's very similar to type 1 or type 2 diabetes in that you develop a problem with insulin," she explained. Alternative Brain Fuel In this case, insulin problems prevent brain cells from accepting glucose, their primary fuel. Without it, they eventually die. But there is an alternative fuel -- ketones, which cells easily accept. Ketones are metabolized in the liver after you eat medium chain triglycerides, found in coconut oil. Dr. Newport added coconut oil to her husband Steve's diet. Just two weeks later, he took the clock test again and demonstrated stunning improvement. "I thought at the time, was it just good luck? Was it a lot of prayer? Was it the coconut oil?" she said. "And I thought, well, we're going to keep the coconut oil going." Three weeks later, Steve took the clock test a third time and continued to perform better on it. And it wasn't just intellectually, he also improved emotionally and physically. "He was not able to run. He was able to run again," she recalled. "He could not read for about a year and a half, but after two or three months he was able to read." "Instead of being very sluggish, not talking very much in the morning, he would come out in the morning with energy, talkative, and joking, and he could find his water and his utensils," Dr. Newport said. She documented Steve's success in a book titled, Alzheimer's Disease: What If There Was A Cure? Dr. Newport received many "thank you" letters from people whose loved ones were suffering from Alzheimer's. Each of the letters claimed their family member was helped after they followed Steve's diet. Expensive Power Punch And while coconut oil is encouraging, there's something much more powerful. A team of biochemists, led by Professor Kieran Clarke at England's Oxford University, have developed a ketone ester that packs a punch ten times greater than coconut oil. "It reaches quite considerably higher levels," Clarke said. "And you can get whatever levels you want depending on how much you drink." The problem is, they need millions of dollars to mass produce it. "It's very expensive. And so we can't make very much of it ourselves," Clarke said. "And what we would like is funding so we could actually scale up and make it." "But of course there's no real profit in manufacturing stuff like that, and so people really don't want to fund that sort of thing," he said. Coconut Oil Myths So until a high potency ketone ester is available to the general public, coconut oil is still a good ketone source. Just make sure it's pure, in other words, non-hydrogenated. Avoid any hydrogenated oil, including coconut oil, because hydrogenated oils are the same thing as dangerous trans fats. Check the list of ingredients for the word, "hydrogenated." 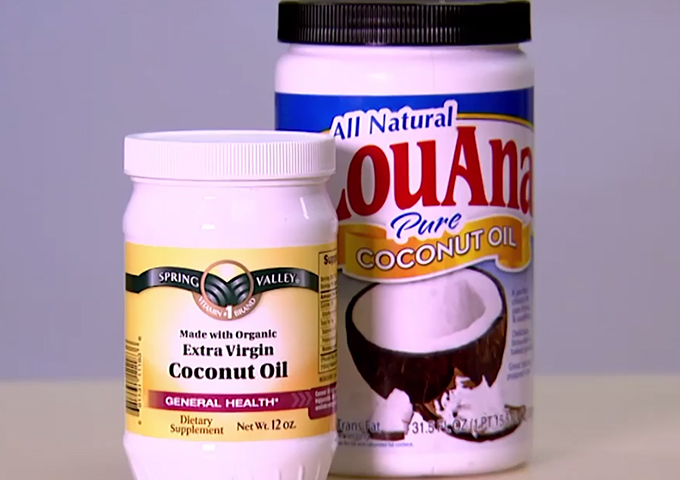 Some people are afraid to eat coconut oil because they think it's bad for your heart. But it's actually very healthy. Dr. Beverly Teter is a lipid biochemist researcher at the University of Maryland and an expert in the area of dietary fat. She said that years ago, coconut oil was criticized for raising cholesterol. But scientists have since learned there are two kinds of cholesterol -- LDL, the bad kind, and HDL, which is very good for you. HDL, the good cholesterol, is the kind that coconut oil raises. "So they put out the message that it increased serum cholesterol," Teter explained. "But the truth of the matter is, it was helping the profile of the serum cholesterol." "That never has been corrected in the public press, and I think that's the reason people have misconceptions about it," she said. Defense against Disease Not only does coconut oil improve cholesterol levels, Teter said the way it helps the brains of some Alzheimer's patients can even be extended to people with Parkinson's disease, ALS , epilepsy, dementia, even schizophrenia and autism. Coconut oil also kills bacteria, making it a natural antibiotic without the negative side effects. Teter said because of that, it also helps defend against viruses like HIV and herpes. "The coconut oil tends to keep the bacteria down so that if you're assaulted with a virus, your immune system can concentrate on the virus. It doesn't have to concentrate on 27 other bacteria that day," she explained. As always, consult your doctor before making any dietary changes and ask about the addition of coconut oil to your diet. *Originally published January 4, 2012. TAMPA, Fla. - An estimated 5.4 million people in the U.S.